Life before, during, and after computers is a life with horses. Horses transcend time, the perfect union of two separate species. Perhaps the only partnership between a strong prey species and a weaker predatory species, in which the prey species willing allows partnership with the predator. In the best of circumstances, the predator improves the life of the horse, rather than exploits him. 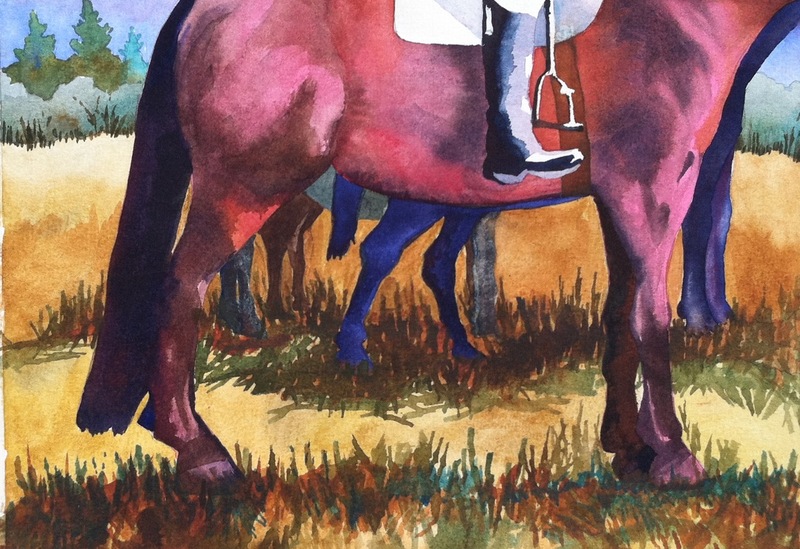 This painting was inspired by photographs I made of the Abbe Ranch May 2011 clinic for 3 Day event riders. More than 100 riders participated in training activities to improve their dressage, show jumping, cross country, general training, and horse management skills. Besides mounted instruction in small groups throughout the ranch, working lunches featured lectures and panels by the clinicians. The rhythm and pattern of shapes as horses & riders lined up to receive their assignments intrigued me to explore this composition as a painting. This entry was posted in equine art, Photography, postaday and tagged art of riding, clinics, equine art, postaday. Love this painting….sounds like you are having fun this summer. Love ya.